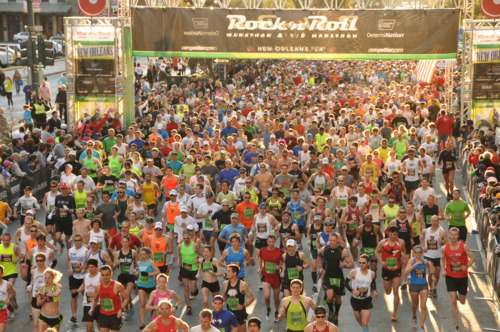 Overall, the Rock n’ Roll New Orleans Marathon (NOLA) was my 11th full marathon, and first since setting my current PR of 3:18:44 at the Rocket City Marathon last December. 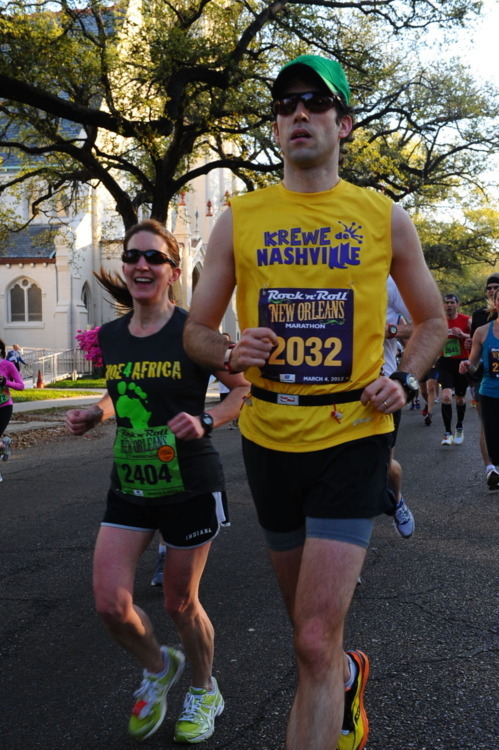 For NOLA I had been very public about my goal of breaking 3:15 for the first time (i.e. my “Quest for 3:15”).” My training leading up to the race had been fantastic, having only missed 4 scheduled runs due to two stomach bugs and a flare-up of my Small Fiber Sensory Neuropathy in January. The weather for NOLA was just about as good as anybody could have hoped. The temperatures were right around 50 degrees at the start, with low humidity, clear skies, and a light breeze. By the end of the race the temps were just over 60 degrees. Can’t ask for much better than that in New Orleans in March. 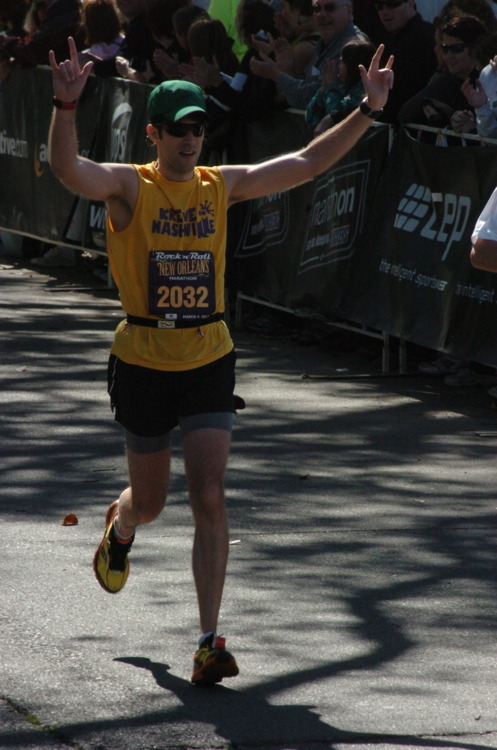 For the second time in my 11 marathons, I only did a two-week taper as opposed to three. The other was before Rocket City last December. I ran 3.5-miles the day prior to the race. I normally don’t run the day before. I ate a peanut butter PowerBar, a banana, a Honey Stinger Waffle, and a bagel 3-hours prior to the race. I drank a full cup of caffeinated coffee 1.5-hours prior to the race. I took a 2x caffeine Gu 1-hour prior to the race, and another 15-minutes prior. I took 6 more Gu packs during the race at 30-minute intervals. I only washed these down with water, taking Gatorade occasionally between Gu packs during the first half of the race. The first of these six was a 2x caffeine, the next two were 1x caffeine, and the final three did not have caffeine. Starting 1-hour prior to the race, I did a 12 minute warmup run followed by 4 x 100m stride outs 15-minutes prior to the race. All during the warmup my legs felt good with no unusual aches, pains, or stiffness. My strategy for this race was to start off fairly conservative and then slowly work my way down to goal pace (7:26). I wanted to try and delay “the Wall” as long as possible, and knew that starting off too fast would bring it on a whole lot sooner. Once the gun sounded, starting conservative was not difficult due to course congestion. I settled into a 7:40ish pace which I held steady for the first three miles down St. Charles Ave. During those first three miles I really didn’t feel comfortable, and was questioning whether or not I had the extra gear I needed to push for 3:15. I kept trying to tell myself to be patient and to remember that I usually didn’t feel good for the first few miles of a race. Thankfully I started feeling better during mile four, and began to click off mile splits around goal pace as we began to work our way back down St. Charles toward the French Quarter. From mile to 4 to mile 9 my splits ranged from 7:19 to 7:28, and I was finally in a groove. I got a little boost during mile 10 when I saw Susan from our group who was cheering. She was planning to pace her sister-in-law Betsy for the second half of the full marathon, but was out on the course cheering until her time to start, which was awesome. With this unexpected boost, I finished out the first half with miles of 7:17, 7:23, 7:11, and 7:21. I remember feeling a little sluggish during mile 11, but I think that section had a slight incline which threw off my rhythm a bit. By mile 13, I was back on my game and finished the first half in just over 1:37 which was right on pace for 3:15. However, I had hit this mark in three previous marathons (2010 Twin Cities, 2011 Chicago, 2011 Rocket City), so I really, really tried to just stay in the moment and not think too far ahead. 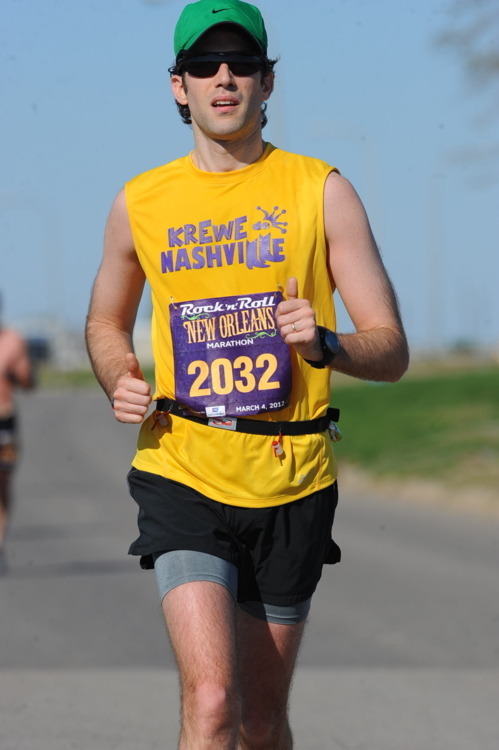 After seeing the course video at the NOLA expo, I had been really dreading the second half with the long stretch by Lake Pontchartrain. From the video it looked very exposed, with virtually nothing to see except light poles. However, I really enjoyed the second half of the course, and began feeling really strong. All of my splits in the second half, except for one, were at 7:26 or less, with eight miles under 7:20 pace. For the first time in my 11 marathons, I felt good enough during the second half of the race to begin focusing on slowly picking off other runners one at a time. Once we reached Lakeshore Drive by the lake, I was picking people off very consistently. I loved running by the lake, except for the short little bridges that popped up everywhere. These provided some steep, stubby hills which were a bit of a challenge on an otherwise flat course. It was awesome on the out-and-back portions to see both Susan, who was pacing Betsy, and John Thorpe, who was rocking it out a couple of miles ahead of me. When I passed John going the other direction, he held out his hand to give me five. As I slapped it I yelled “BEAST MODE….ON!” I continued to feel strong through mile 20, where I threw in a sub 7:10 mile. At this point I started thinking about whether or not I had enough in the tank to try and break 3:10 and qualify for Boston. Thankfully I talked myself out of this nonsense and tried to remind myself to just stay smooth. I started to feel significant fatigue in my legs during mile 22. I also started to feel the warmth in the air for the first time and started dumping water over my head at every aid station. This sensation continued to intensify for the remainder of the race but I was able to stay on pace with miles of 7:23, 7:20, and 7:26 through mile 24. During mile 25 I was able to see City Park where the finish line was located, and I also saw Dan Ashmead from our group who had earlier finished the half marathon in 1:38. When I reached Dan, he yelled “can I run with you for a bit?” I yelled back “absolutely” and he jumped in. He ran with me for about a quarter of a mile and kept telling me how great I was doing and how good I looked. Dan gave me such a shot of adrenaline that my pace picked up significantly, and I finished mile 25 in 7:13. Mile 26 was completely inside the park, and my legs were shot. I never hit the wall in this race, but my legs were screaming at the end. I knew that I had no chance of a BQ no matter how hard I ran the last mile. I also knew that I could still break 3:15 at 9:00min pace. With this in mind, I slowed down just a bit to make sure I didn’t cramp up in the last mile (7:31). Though it was not without a few mistakes, this was by far my most well executed marathon, and possibly my best race ever at any distance. I’m now looking forward to the next challenge (or Quest) and the journey to take it down. Celebrating with Olivia after a successful race day! 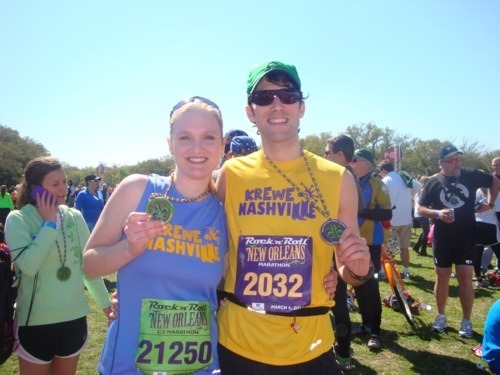 Olivia: The NOLA Half Marathon was Olivia’s first race since the One 500 Festival Mini Marathon last May, and her first since being diagnosed with bilateral tibial stress fractures (and severe shin splints) last summer. She has experienced many ups and downs since the injury, and I honestly didn’t know what to expect for this race. Well, she BLEW IT OUT OF THE BOX with a 2:41 finish and new PR by 2-minutes! Not only did she set a PR in her first race back, but she did so without significant discomfort in her shins. I’m so proud of her for working so hard to get back. It was awesome to be able to spend a great weekend, in a great city, with my beautiful bride, AND for BOTH of us to set a new PR in the race. 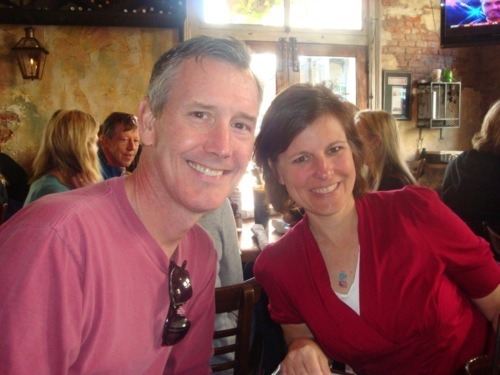 Marc and Janna Dedman: Without Marc and Janna this trip would have never happened. They pitched the idea to the group, found the perfect hotel, sent us tons of information on New Orleans, made dinner reservations, coordinated our team shirts, answered our never ending questions, and allowed us to follow them around like lost puppies! Marc and Janna are special people, and it was awesome to be able to spend the weekend with them. Dan Ashmead: I’ve posted many times about how instrumental Dan has been in my rapid running improvement over the past three years. 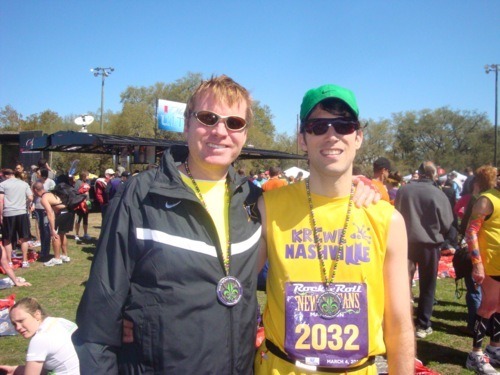 At NOLA, Dan was a source of constant encouragement and confidence in my ability to break 3:15. The fact that he ran part of mile 25 with me was very special, especially considering that he had been standing around for almost an hour and half after running a 1:38 half marathon. I would have been stiff as a board! Krewe de Nashville: For this trip we had group shirts with an amazing “Krewe de Nashville” design created by Melinda Tate. I’ll readily admit that I was not a huge fan of the idea of getting team shirts since I am so picky about my race clothing. However, they turned out to be awesome! In addition to the great design, it was also cool to have something that uniquely identified our group and our great city. I can’t remember how many times I heard someone yell out “Go Nashville!” but it was a lot! 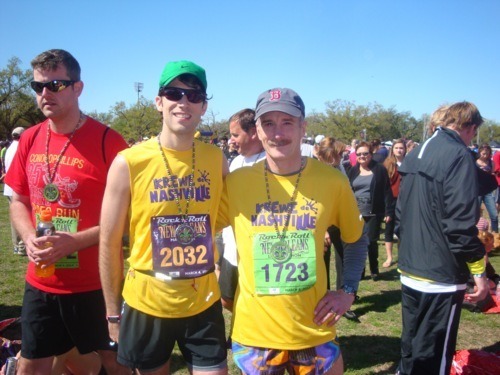 Our running group is really, really fantastic, and I’m kinda hoping the “Krewe de Nashville” moniker will stick. 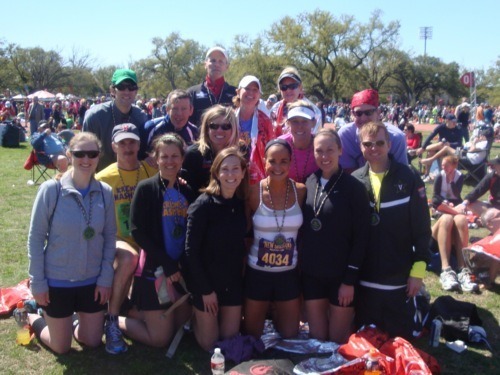 If you are a runner who lives in Nashville and do not run with our group, you are really missing out. A big shout out to Marc and Janna Dedman, Edward Russell, John Thorpe, Susan Johnson, Olivia Agee, Malcolm Pfotenhauer, Dan Ashmead, Jenny Jervis, Michelle Thomas, Pamela Hobson, and Vicki Schmidt for making this such a great trip! They are notorious for merging the full course back with the half later in the race causing chaos. However, even with all of this, I would have to give them a solid “A” for the NOLA event. The first half of the course is extremely well designed and interesting, and surprisingly the second half was MUCH better than I expected (see more below). All full and half marathon participants received a gender-specific Brooks technical t-shirt (very high quality). The finisher’s medal is great (like all Rock n’ Roll events) and incorporated Mardi Gras beads. There were 17 aid stations and every other one had both water and Gatorade. I was surprised that the water and Gatorade were not in different cups. The mile markers were elevated, making them easy to see, and all included split times. They had mylar heat blankets and lots of food and drink at the finish. The volunteers are great and enthusiastic. The bag check location was clearly marked at the race start, but was an unusually long way away from the finish. The fact that the weekend includes a kid’s race and a half marathon makes it a great event for the whole family. Overall the NOLA course is pancake flat. Very similar to the Chicago Marathon or the Indianapolis Mini Marathon as it relates to elevation changes. As mentioned above, the only hills of any significance are the short bridges on Lakeshore drive by Lake Pontchartrain. I was slightly concerned about the conditions of the roads on the course, but this turned out to be mostly a non-issue. Apparently a lot of work had been done in advance of the course, and it was in pretty good shape. The first half of the course was a great tour of New Orleans and included; A long out-and-back stretch on St. Charles Ave which was beautiful, a pass through the French Quarter on Decatur St. which went by Saint Louis Cathedral, and a finish up Esplande Ave toward City Park. The second half was the big surprise of the race. After a long, tree-lined stretch up Marconi Dr, the course turned onto Lakeshore by Lake Pontchartrain. I was worried this would be a barren wasteland, but I really enjoyed running by the lake. The water was beautiful, and I enjoy out an back sections on race courses. The finish back down Marconi was slightly downhill before a final slight uphill in City Park. City Park made for a excellant finish area with plenty of room to move around. Well…that’s about it. If you made it all the way to the end, thanks and congratulations! Grab some water and take a break. You earned it!